Aiko Telgen's new plasma filled lamp - 'Ion Two'. Photo by Aiko Telgin. Having created his first ionized gas light (known not surprisingly as 'Ion One') while a student at the School of Arts & Design, Kassel, German designer, Aiko Telgen has now developed the process and produced the new ‘Ion Two’. It really has to be seen to be believed. I was lucky enough to stumble across the light while visiting the young designers area in the basement of Superstudio Piu during the Milan Furniture Fair last April. In a secretive little make-shift room, swathed in heavy black curtains, I was mesmerized by the leaping glow of Telgen’s light. It is not a 'light' in the normal sense of the word - it gives off very little actual light - certainly not enough to read by - but it is a beautifully crafted glass vessel made up of a four horizontal and one vertical cylinder. The glow that comes from within is quite eerie and seems strangely alive. A view of how the proximity of a human hand causes the intensity of the plasma to increase in Telgen's 'Ion Two'. Photo by Florian Seemüller. Using trapped ionised gas inside the borosilicate vessels, Telgen has created a light where the internal glow of the gas reacts with human touch. As a body or hands move close to the glass the orange glow of the gas appears to intensify and move. Apparently it’s all down to the tiny charge our body emits………......The plasma in the vessel is the inert gas, Neon. I have no real understanding of how or why it does what it does but I do know is that it is extremely beautiful and thoroughly mesmerizing to just sit and watch - and highly addictive to play with. 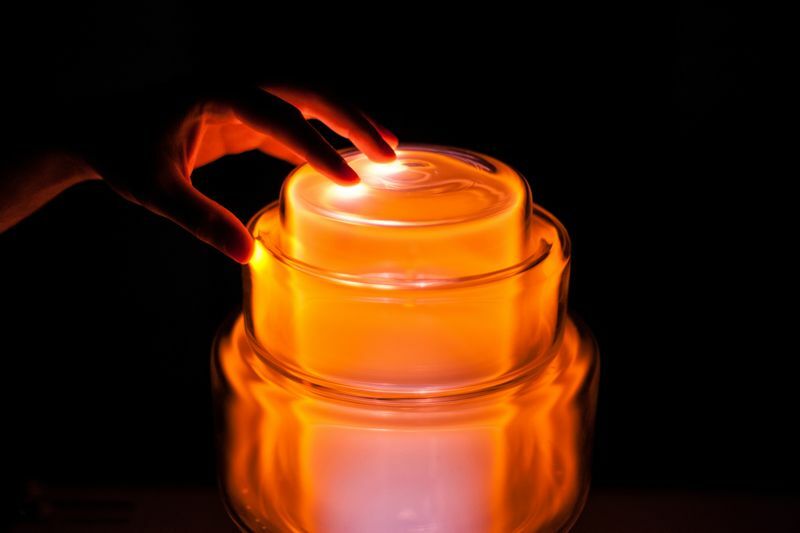 While the designer admits that it is unlikely to ever become a serially produced object because of the accuracy of glass blowing required and the difficulty of trapping just the right amount of plasma inside each donut shaped cylinder, he does hope that a limited edition run of the lights may one day be possible. The 'Ion Two' on show at Superstudio Pui during the Milan Furniture Fair April 2013. 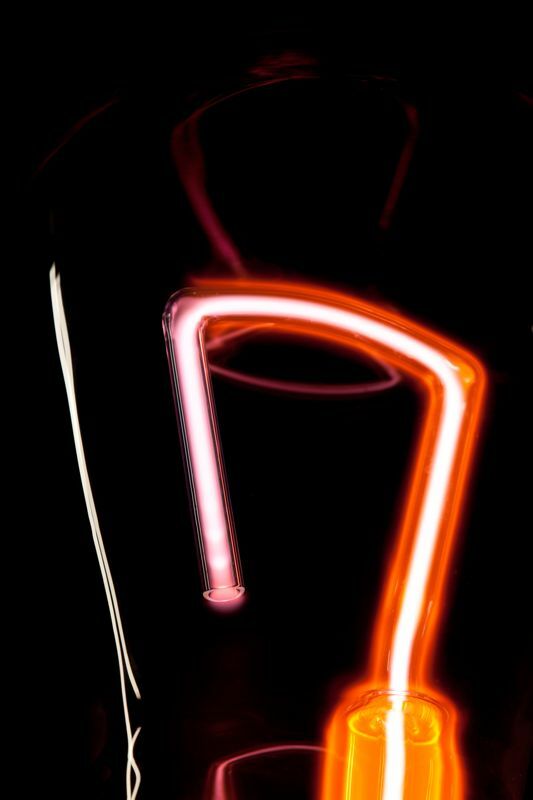 Filled with the inert gas Neon and powered by a high voltage, the glass objects show the genesis of light itself. The glass rings can be placed anywhere in the close proximity of the glass cylinder. The electrical field is able to initiate the ionization whether the glass rings are approaching the cylinder or within a certain distance – helped by the human body. “I began this exploration of light with the theme, “A Floating Light,” and started my research about everything around the topics of floating elements and the nature of light. When I visited a small neon sign factory in East Germany I got a first impression of the technology and realized the difference between fluorescent light (generated by UV light), which is widely known and used, and the pure light of plasma. The plasma process is usually hidden inside fluorescent tubes but has a very special appearance. I then got deeper into the topics of plasma and neon technology and looked into the experimental research of several people like Nikola Tesla, Dan Flavin and James Turrell", commented Telgen in an interview with Paolo Ferrarini for Coolhunting in April 2013. Aiko Telgin and Annika Frye. Together they are Aiko & Annika Industrial Design. Check out a brilliant video of the light in action below or go to Telgen’s website for more (although some of it is only in German). The project was realised with the help of Ferdinand Schubert, NP Lighting, Warburg. The music featured on the video is by Oskar Schuster, Bad Panda Records.